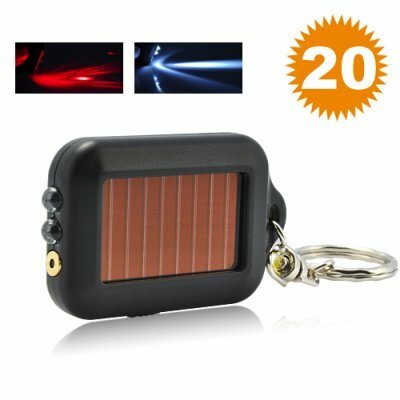 Successfully Added Solar Powered Laser Pointer LED Flashlight Keychain Fob to your Shopping Cart. Sturdy, dependable and well-built, this solar powered LED pointer and LED flashlight key fob is the perfect tool. It's inexpensive yet highly practical making it the perfect gift as well! Perfect Tool: Hang it on your keychain or cellphone and you've got a handy laser pointer and LED torchlight when the need arises. Need to point to something on the roof? Need to point out something across the room? Where is it? Click. It's there! Or how many times have you tried to open your house or car door at night and wasted precious minutes trying to fit the key in the hole? It's worse in the winter time with the freezing cold. Shine some light on that keyhole and be blind and frozen no more! Perfect Gift: Because it costs roughly 2 dollars, it's the perfect gift for friends, coworkers, or all the people in your neighborhood who provide you with services like the mail man, the dry cleaning guy, or your favorite barista at Starbucks. It makes them feel great to receive a gift from you and you're only out of pocket 2 dollars! Better yet this incredible solar-powered laser pointer and LED flash light keychain fob makes the perfect corporate premium. Give these amazing promotional item out at trade shows or trade fairs and watch the sales orders come flying in! And So Perfectly Simple: Unlike other gadgets that run out o power or need replacement batteries, this amazing device is solar-powered. Just leave it in sunshine or room light for a few hours and you're fully charged. What's more, the solar powered laser pointing LED torchlight keychain fob is so easy to use! So inexpensive, so useful, and such a great personal or corporate gift. The Solar Powered Laser Pointer LED Flashlight Keychain FOB...brought to you by the online gadget specialists - Chinavasion.